This is the million dollar question. Essentially, this tool is used to track data on your website using small snippets of code also known as tags. Google Tag Manager is a platform that allows you to manage all these tags without the need of your development team. What problem does Google Tag Manager solve? If you are marketer, it is essential to use tracking codes to measure the performance of your campaigns. Traditionally to install these codes, you would need back-end access to the website to install these codes. Google Tag Manager allows you to use a central management platform to deploy codes without back-end access. Google Tag Manager is typical set up for a single website comprises a single account with multiple websites. Each website having a single container that holds multiple tags that are fired with a trigger. However, setups can be much more complex depending on the marketer’s needs. 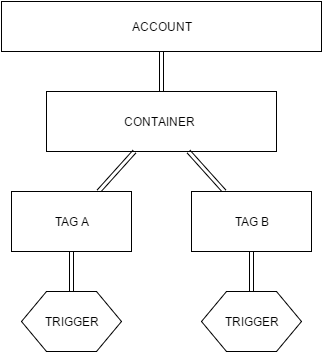 A Google Tag Manager Container is a exactly as it sounds. It’s a container or bucket that allows you to house all your tags. If you are unfamiliar with a tag. This is a simple code snippet that is used to. These tags can be used to measure user behavior metrics such as conversion, scroll tracking and other customization. Google Tag Manager has a collection of common tag templates at your disposals. This ranges from first party tags such as Google Analytics to Linkedin. However, you can also create custom HTML tags that fit your needs. Tags work when you set rules for it. These rules are known as triggers. You can “fire” or trigger your tags from within a user friendly interface. There are multiple types of triggers. Additionally, these triggers can further optimized to fire based on your rules. Variables can hold various types of information. This data can come in the form of strings, numbers, arrays and objects. Google Tag has a number of preset variables that can be utilized. However, these data types can be customized to fit your needs or created. To see some examples of what can be tracked in Google Analytics. Click the Google Tag Manager Tutorials link. Remember that you will need to start with your container tag. This is free and just required a Google account signup. Once this is completed, you will have access to the the script that you can install on your website. For best practices, its best to install this container tag in your header. 4. Place this script in the head section.